Would reducing social inequality lead to more years of healthy life? Across Europe, there’s good news for older people – life expectancy is on the rise and levels of disability among older people are falling. But there are concerns that a longer life may not be a better life for all. So who benefits from increased life expectancy? Jenny Head and colleagues from the IDEAR network find those with a higher occupational status can expect the greatest number of years of healthy, disease-free life. We know from lots of studies that there are big differences in life expectancy between different social groups. And we know that those in higher social positions tend to benefit more from that rise in healthy life expectancy. But, given that many governments expect people to extend their working lives, we specifically need to know about the different expectations of people in different occupational positions – which is slightly different. Together with colleagues in the IDEAR networK, we looked at what those from different occupational backgrounds might expect in later life – to be precise, how many years with good health can they expect to enjoy between the ages of 50 and 75? The data came from four cohort studies in England, Finland, France and Sweden. We were able to look at data from 9,213 people in the English Longitudinal Study of Ageing from 2002 onwards. We also had information on 42,978 people who took part in the Finnish Public Sector study between 1997 and 2013. In France, we used the GAZEL Cohort Study, which gathered information from 18,263 people working for the national utility company from 1989 onwards. And in Sweden, we looked at a sample of 8,186 people who responded to the Swedish Longitudinal Occupational Survey of Health between 2003 and 2014. We used two health measures: whether participants rated their own health as good or poor, and whether they had ever been diagnosed with heart disease, stroke, chronic lung disease, cancer or diabetes. In all the cohorts, people in lower occupational positions could expect fewer years of life than those in higher occupational positions – and they could expect to spend fewer of those remaining years in good health. So in England, both men and women in high-grade occupations could expect more than four years’ extra healthy life when compared with men and women in lower-grade occupations. In Finland that gap was wider, with those in high-grade jobs expecting at least six and a half years more good health. In France the difference was around two and a half years, while Sweden had the smallest gap of a little more than two years. This pattern was consistent across the four countries and for both men and women. There were also socioeconomic inequalities in chronic disease-free life expectancy, although these differences were less marked than for self-rated health. Why does this matter? A better understanding of the future health of older people is crucial to policy-makers because it affects public expenditure on income, health and long-term care. It also matters because governments want to extend working lives and increase State Pension ages, and in order to do that they need older workers to stay healthy. Our results indicate that those in lower socioeconomic positions may be doubly disadvantaged because they have worse health but may also need to work longer for financial reasons. To achieve extended working lives for all, policy-makers will need to find ways of reducing those social class differences in health expectancies. Socioeconomic differences in healthy and disease-free life expectancy between ages 50 and 75: a multi-cohort study, by Jenny Head, Holendro Singh Chungkham , Martin Hyde, Paola Zaninotto, Kristina Alexanderson, Sari Stenholm, Paula Salo, Mika Kivimäki, Marcel Goldberg, Marie Zins, Jussi Vahtera and Hugo Westerlund, is published in the European Journal of Public Health. This entry was posted in Journal article and tagged Ageing, Career, Disability, Employment, English Longitudinal Study of Ageing, Health, Heart Disease on December 5, 2018 by Chris Garrington. Work stress and ill health – what’s the link? Lots of studies have suggested stress can be a cause of ill health – and that leads to people ceasing to work before they reach retirement age. But most have offered only a snapshot on the issue. Now a new analysis of data from a major panel study by José Ignacio CuitúnCoronado and Tarani Chandola from the University of Manchester has shed new light on how work stress can affect an employee’s health over a longer period. Many animals have the ability to adapt to environmental changes and pressures so that they’re better prepared the next time they happen. Bears can put on fat as winter approaches, for instance, to help them stave off hunger and stay warm. And human beings can do this too. Stressful situations trigger chemical responses which can help to give us extra resources when things are tough. Our neuroendocrine systems, for instance, trigger hormonal responses which enhance our physical performance when we need it most. But these valuable systems can have a down–side. In our research, we wanted to look at how repeated exposure to stressful situations might contribute to health problems, particularly in people nearing the end of their working lives. We call this stress-induced effect ‘Allostatic Load’ – the “wear and tear” on the body that accumulates as an individual is exposed to repeated or chronic stress because of fluctuating hormonal responses. Given that many governments are looking for ways to extend working lives, there’s particular interest in finding out how stress can affect the health of older workers.We were able to tap into a rich source of information – the English Longitudinal Study of Ageing (ELSA), which has followed a representative sample of almost 10,000 over–50s since 2002. These participants have been interviewed regularly and one of the things they’ve been asked to report is whether they’ve experienced a sense of imbalance between the effort they put into their jobs and the rewards they get out. This gave us a sample of 2663 older adults, all over 50 and living in England, who’d reported these feelings at least once and who’d been assessed as having had an adverse reaction to them. We wanted to know whether repeated episodes had a bigger effect than just one, and whether the effect would be just as strong for past episodes as it was for more recent ones. Between 2004-5 and 2014-16 the group were asked about stress at work, but they also underwent physical tests to see how the various systems in their bodies were bearing up. They were visited by nurses who carried out a battery of tests including taking hair samples to assess levels of the stress-related hormone cortisol, carrying out blood pressure checks to provide information on their cardio-vascular systems, white blood cell counts to assess their immune systems and cholesterol checks on their metabolic systems. Participants also had measurements taken of their waist to height ratios – a good indicator of coronary heart disease risk factors. 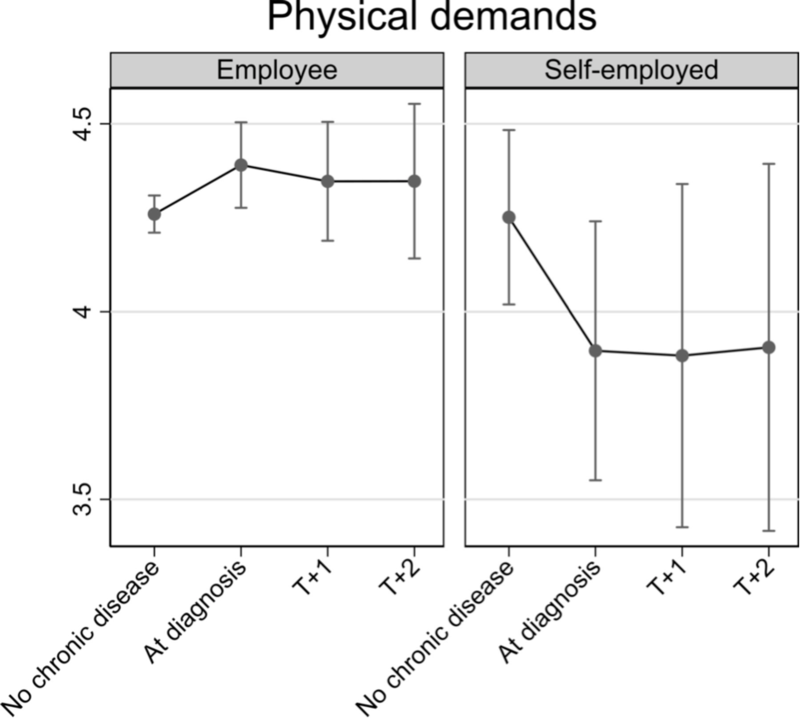 Overall, we found the more occasions of work-stress a participant had reported, the greater their ‘Allostatic Load’ index – that is, the greater the amount of biological wear and tear. Moreover, the evidence suggests that employees who had experienced stress more recently (towards the end of their working career)had higher levels of health risk when compared to those who had experienced it earlier in their careers. This suggests there is an association between repeated reports of stress at work and biological stress mechanisms, which in turn could lead to stress-related disorders such as coronary heart disease, type-2 diabetes or depression. This also suggests that previous cross-sectional studies which reported small or inconsistent associations may have suffered because they were only measuring one effect at one time. Work-related stress is one of the reasons for labour market exit – and our findings would suggest that earlier, snapshot studies may have underestimated the true effect of work-related stress on health over a lifetime. As this is an observational study, it is not possible tomake any causal claims. Also, there may be other factors that we have not taken into account that may explain the association between stress and disease risk. For example, sleep problems may be relevant – though they may also be part of the journey from stress to ill-health. But equally it is possible that cumulative exposure to work stress is resulting in damage to employees’ physical health, which is then leading to disability and an early exit from the world of work. So, if we want to extend working lives then reducing work-related stress could be one of the keys to achieving that goal. Environmental Reasearch and Public Health. This entry was posted in Journal article and tagged Allostatic load, Career, Cholesterol, Cortisol, Diabetes, Employment, English Longitudinal Study of Ageing, Extending working lives, Health, Heart Disease, Mental health, Occupational health, Stress, Work on July 17, 2018 by Chris Garrington. Frailty: what is the connection with our working lives? People are living longer, and the number of over-65s is expected to reach around one in four of the UK population by 2050. But is retirement a golden age, or will we be dogged by poor health? Wentian Lu from University College London and colleagues investigated how our working pattern throughout our lives affects our health after we retire, and found interesting differences between men and women. Government policies are focused on extending our working lives, and record numbers of people are now working beyond state pension age. But what effect is it having on our health? The UK government’s former older workers champion, and pensions expert, Dr Ros Altmann argues that raising the state pension age is a blunt instrument for managing old-age support, which could compound existing social and health inequalities. With people being expected to work for longer, it is critical to understand whether and how people’s working lives affect their later life health. A recent study led by colleague Dr Giorgio Di Gessa found no significant health benefits from working beyond state pension age, once social background, previous health and employment histories were taken into account. Our investigation was the first in England to focus on the impact of earlier working patterns on health in later life. We used information on more than 1,600 men and nearly 2,800 women from the English Longitudinal Study of Ageing. Health-related information on a range of things such as chronic conditions, pain, depression, heart disease, falls, fractures and joint replacement was used to develop a frailty index. Using detailed work histories between the ages of 16 and 64 for men (16 and 59 for women), they were divided into groups which ranged from ‘full-time employment throughout’ to ‘unemployed throughout’. For men, we considered those who left work early, at either 60 or 49 years, and those who started work late (e.g because they went to University or spent time gaining other qualifications) and retired at 60. For women’s employment histories, we also took account of part-time working, long and short career breaks, family care, and those who only had occasional work and retired early. The study confirmed that frailty increased with age, accelerating after 65 for women and 70 for men. The findings showed that women who took a short break for family care and then worked part-time until they were 59 had better health at retirement age than those who were mostly in full-time work. Experiencing long career breaks or only working occasionally also appeared to be more detrimental for women’s health. This finding supports the importance of work-life balance for women’s health in later life. Women who returned to work part-time after a short career break were healthier than those who went from family care to full-time work. If further studies confirm this result, it would indicate that working part-time while their children are young can have long-term positive benefits for women’s health. The key to maintaining the long-term health of today’s generation of working mothers will be to promote flexible working policies, such as flexible start and finish times, allowing women to balance work and childcare. Consistent with previous studies, our investigation found that women who have never worked tend to have poorer health than those who worked full-time until the age of 60. What was more surprising was that women who never worked experienced a slower decline in their health beyond the age of 60, even when social background and health-affecting behaviours such as smoking and drinking were taken into account. Men who retired early at either 49 or 60 had poorer health than those who worked until they were 65. However, leaving paid employment before the age of 65 slowed down the progress of poor health in later life. This supports the findings of previous studies which show that the burden of ill-health is substantially relieved by early retirement. With Government policies encouraging older people to work longer, our research lends further weight to concerns that this may not be good for those already suffering poor health. Another unexpected finding was that men who started working later in life and retired at around 60, who tended to be those more highly educated and with greater social advantage, actually experienced more rapid declines in health after the age of 65 than those who worked full-time from an earlier age and retired early. This was a small group, so further research is needed to explore this in more depth. Despite limitations imposed by some of our employment history groups being quite small, as well as possible biases coming from participants’ subjective reporting of health issues, our findings offer important pointers for developing effective strategies to improve health for older people in the UK. If, as Dr Altmann suggests, the government could replace the blunt instrument of raising state pension age with more finely-tuned policies, allowing those who can and want to extend their working lives to do so in a flexible way, this would be fairer and give the most vulnerable a better chance of enjoying a healthy retirement. Relationship between employment histories and frailty trajectories in later life: evidence from the English Longitudinal Study of Ageing is research by Wentian Lu, Rebecca Benson and Amanda Sacker of University College London, Karen Glaser and Laurie Corna of King’s College London, Loretta Platts of Stockholm University, Diana Worts and Peggy McDonough of the University of Toronto, Giorgio Di Gessa from the London School of Economics and Political Science, and Debora Price of the University of Manchester. It is published in the Journal of Epidemiology & Community Health. This entry was posted in Journal article and tagged Ageing, Career, Employment, English Longitudinal Study of Ageing, Flexible working, Frailty, Health, Heart Disease, Pension, Retirement, State Pension Age, Unemployment, Well-being, Work on March 6, 2017 by Chris Garrington. Are permanently sick people less sick nowadays? Brexit aside, there have few topics more hotly contested in recently years than who should get incapacity benefits. The steady rise in the incapacity benefits bill over several decades led some to question whether greater numbers of people could actually be sick and whether this group is actually healthier, with less serious health problems, than had been the case in decades past. But what does research evidence tell us? Bola Akinwale from Public Health England and colleagues at the ESRC International Centre for Lifecourse Studies have looked at 30 years’ worth of data to see. In the last 30 years of the 20th century, life expectancy for those aged 65 increased more than it had in the previous 70 years. A job market that had been almost completely dominated by men became dramatically more diverse. By the turn of the century, very few men aged 60-64 were in paid work, although that number has since increased. On the face of it, many of these changes represent good news, but they have also created new challenges around funding pensions and how to keep increasing numbers of older people healthy and active for longer. Our research looked at the proportions of men and women around State Pension Age who were employed, unemployed, permanently sick (those we might expect to claim incapacity benefits) or retired. We went on to look at their health immediately after retirement age to see if they had died prematurely or had a limiting long-term illness or disability. By 2001, women were almost as likely as men to describe themselves as retired after State Pension Age and 12.4 percent of 55-59 year-old women described themselves as permanently sick in 2001 compared with 3.4 percent back in 1971. So we see the proportions of permanently sick men doubling over 30 years and quadrupling for women. Across the same time frame, the risk of dying just before State Pension Age decreased substantially – by more than 60 percent for men and by more than 50 percent for women, irrespective of whether they are in work or permanently sick. In other words, both groups benefited equally from these changes – staying healthier and living longer than their counterparts 30 years previously. Are sick people less sick nowadays? The answer is no and yes – it depends on the comparator. To try to get to the bottom of this idea that people who are permanently sick are less sick than their historical predecessors, we compared the likelihood of them dying prematurely with that of their working peers. On the one hand, if they were less sick, we would expect to see the gap between the chances of dying prematurely for these two groups get smaller over the 30-year period. We don’t see that. Permanently sick men aged 65-69 were three times more likely to die prematurely than their working peers in 2001 and this was an increase on the 1971 figure. For women, the figure was between four and five times over the period we looked at. On the other hand, it’s clear that this 30 year period brought about some remarkable changes in the working lives and general health of older people, including among permanently sick group. Their life expectancy has increased in line with other people of their age. But despite these improvements in life expectancy among permanently sick people, compared with employed people their likelihood of dying has, if anything, slightly increased and certainly not decreased. So, taken together, our research does not support the argument that the permanently sick have less serious health conditions nowadays than they used to. A key plank of the Government’s policies for people who are unable to work due to illness is to try to support them back to work wherever possible. Our research shows that achieving this aim, requires careful consideration of the types of jobs and working environments that might be suitable for people with chronic illnesses. If we don’t create enough jobs that older people with chronic illness can sustain and thrive in, life expectancy gaps between those in work and those who leave the workforce prematurely due to ill-health may widen further. Work, permanent sickness and mortality risk: a prospective cohort study of England and Wales, 1971-2006 is research by Bola Akinwale, Kevin Lynch, Richard Wiggins, Seeromanie Harding, Mel Bartley and David Blane. 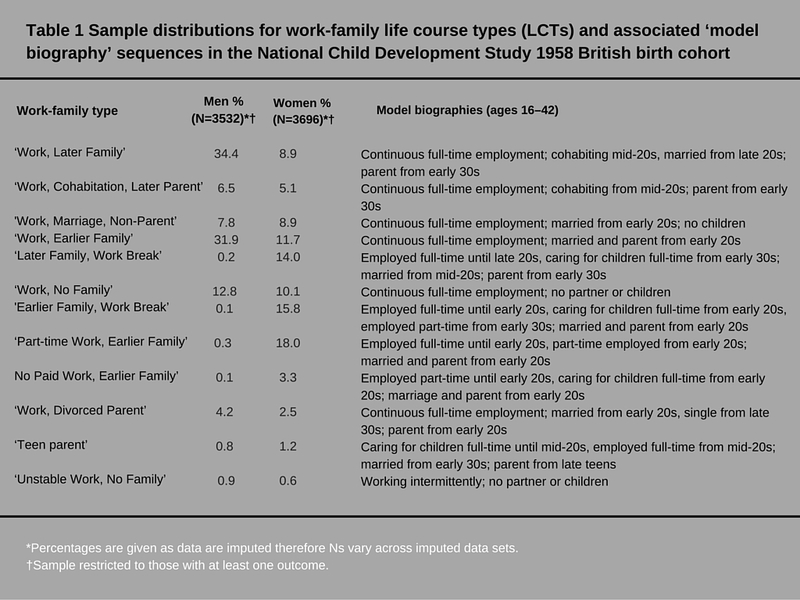 It made use of linked census and death records in the ONS Longitudinal Study. This entry was posted in Journal article and tagged Ageing, Disability, Employment, Flexible working, Health, Heart Disease, Incapacity benefit, ONS Longitudinal Study, Public Health England, Retirement, Sickness, State Pension Age on July 20, 2016 by Chris Garrington. How our working and family lives affect our health as we get older is of increasing interest to us all. Researchers at the ESRC International Centre for Lifecourse Studies have used the 1958 Cohort Study to look at levels of inflammation (indicators of being at risk of illnesses such as heart disease) and and how people combine their work and family lives to see if any patterns emerge that could tell us more. In this episode of the ICLS Podcast, Dr Rebecca Lacey explains the background and context of the research and what the team has found. You can also listen to a policy seminar talk about the research. This entry was posted in Podcast and tagged 1958 Birth Cohort, C Reactive Protein, Employment, Family, Fibrinogen, Health, Heart Disease, Inflammation, Inflammatory markers, Well-being, Work on June 7, 2016 by Chris Garrington.